His Majesty King Bhumibol Adulyadej (Rama IX) passed away at Siriraj Hospital in Bangkok today, 13 October 2016, at 3.52pm, the Royal Household Bureau announced. He ascended the throne on 9 June 1946 and was crowned King of Thailand on 5 May 1950 and reigned for 25,694 days or 70 years, four months, and four days. The government has announced a one-year period of mourning, during which government officials will wear black, and that flags will fly at half-mast for 30 days. The first real impact will be on the overall economy, which will suffer real pain as a mirror of the people’s heartfelt suffering over the loss of their revered monarch. We expect most events to be postponed and for consumption to slow during this period. In addition, it is quite possible that some investment will be put on hold. Consider that on 2 January 2008, Her Royal Highness Galyani Vadhana, Princess of Naradhiwas, elder sister of His Majesty King Bhumibol Adulyadej (Rama IX) passed away. At that time, the government announced a mourning period of 100 days, and government officials wore black for 15 days while the cabinet would go on to wear black for the full 100 days. It is also notable that, during the first quarter of 2008, the Thai economy grew 3.3%, the weakest of all countries in Asia. Thailand started to recover relative to other countries in Asia by the second quarter. Based on this past experience, the Thai economy could be weak for as much as a six-to-12-month period. Thailand has been dealing with political strife over the past decade or more. This has had an impact on the stock market as well as the overall economy. The SET index has done relatively well during this period with a return of 104% relative to 60% for ASEAN and 53% for Asia ex-Japan. An interesting feature of Thailand is that when political turmoil persists profits of listed companies tend to rise. This was due to new competitors losing access to funding and therefore pulling back on investment. This left room for the large incumbents to strengthen their positions and profit margins. In fact, Thailand has been the slowest growing domestic economy in Asia. Over the decade since this political strife emerged, the consumption component of Thailand’s GDP grew slowest in Asia at 2.1% per annum, versus about 3.2% for all of Asia. Much of the strife was driven by divisions related to popular and deposed former prime minister, Thaksin Shinawatra, who presented a serious challenge to Thailand’s established power structure. Since the 2001 election, Thaksin or his related political parties, have won every one of the past five elections. With his prior ouster and the recent May 2014 military coup deposing his sister, his opponents seemed to have a distinctly firm grip on power. Who controls the transition of the Thai Monarchy is operating under considerable pressure as the Monarchy’s wealth was estimated by Forbes magazine at US$30bn, the richest in the world. The military government has shown its determination to assure a smooth transition to the new sovereign, and the next in line was His Royal Highness, Crown Prince Maha Vajiralongkorn, who ascended the throne soon after the death of his father. Thailand is sailing into unchartered waters, considering that nearly everyone alive has only known one King and that his fiat power was immense, built up over years of devotion to the country. No incoming Monarch could expect to instantly garner such levels of devotion. This could shift the resolution of conflicts back into the political arena as the population will no longer feel the comfort of the guiding hand of the Thai Monarch. We doubt the notion that political strife will quickly appear in Thailand as it would be inappropriate for any political party to attempt a move to gain supremacy during the period of mourning. So, we expect politics to be relatively calm for at least most of the next year. 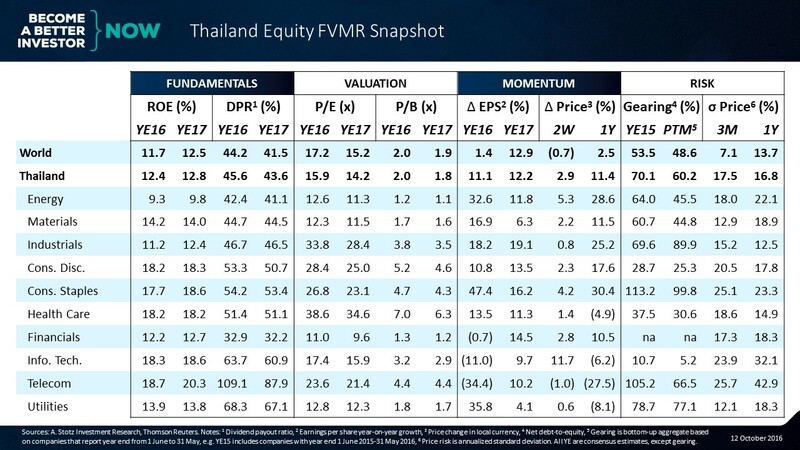 We expect that the Thai stock market will be hurt in the near term, but will eventually stabilize and we expect foreign funds to flow back into the Thai market. The market is currently trading on 16x PE, which is about in line with Asean countries, but a bit more expensive than Asia ex-Japan’s 14x. We think that the Health Care and Materials sectors should do decently over this period and that Consumer Discretionary stocks will be hit the hardest. Some stocks that should be somewhat immune are IVL, CK, BH and ADVANC. Advanced Info Service (ADVANC): The company’s 4G cost is already priced in. The mobile operator has very solid fundamentals and has extended its network’s life after winning the 900Mhz license. Despite the national mourning period, we expect phone and internet usage to still be strong. Bumrungrad Hospital (BH): The hospital and health care services company has less exposure to the local economy, with about 65% of revenue derived from foreign patients. Also, its financial fundamentals are rock solid. Ch. Karnchang (CK): Contractor specializing in government projects has a very strong backlog and solid affiliates: TTW, CKP, and BEM. These are unlikely to be severely hit by the period of mourning. Indorama Ventures (IVL): Makes and sells polyester, plastics and chemicals globally so Thailand demand is almost irrelevant to its revenue. Demand in 4Q16 for chemicals, especially olefins and aromatics, will be robust due to the coming festive season. Demand for polyester should also be strong as winter weather hits. Though margins may soften, output should be strong after this year’s expected acquisitions.